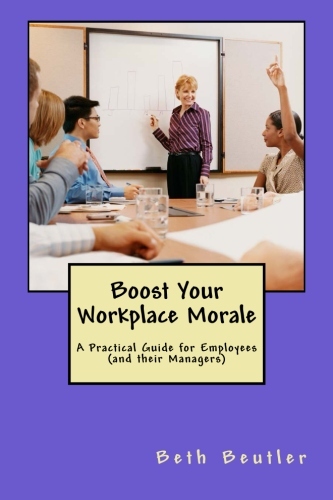 YOU influence your workplace morale! Get to it! Four Ways to Boost Your Morale at Work – A post, a video, a new book, and a bonus opportunity! 1. Quit whining. No workplace is perfect, and sometimes you feel like venting. But if that’s the only thing you do, rather than try to figure out a solution, you’ll always be unhappy. 2. Consider others as better than yourself. That annoying coworker? Try to think of her with more honor than you give yourself. Pray for her. Do something nice for her. Be thankful for something about her. 3. Do something kind for your coworkers. Bring in a treat. Clean up the break room. Give someone a compliment. 4. Try some creative ideas such as games or discussion prompters. I know just the source for them! Each chapter has twelve ideas, to make it easy to consider, discuss, or experience one per month for a year. There is a bonus chapter of resources as well. The book is now available in paperback ($5.39) or e-book ($2.99) via Amazon. Click here for more information or to order. BONUS: The special “launch” period for this book is July 24-August 3, a 10 day period with unique opportunities! During this period only: Buy either version of the book and you’ll receive a free PDF of a basic personality assessment (normally $3.99) mentioned in the book. I’d like to get Boosting Workplace Morale into as many hands as possible during launch week. Thank you for your help! Enter below!